Walmart Family Mobile is a T-Mobile MVNO, and today the wireless provider carrying the name of the nation's largest retailer announced a new high-end plan for subscribers. For $49.88 a month, subscribers can get unlimited talk, text and 10GB of 4G LTE data. If you don't need so much data, you can buy a plan that comes with 5GB of 4G LTE data for $39.88 a month. For $29.88 a month, customers can get 1GB of 4G LTE data. The latter two plans also come with unlimited talk and text. Once the contracted amount of data on each plan has been consumed, customers' data speed is throttled. Walmart Family Mobile also has its own version of Binge On. Starting late last month, the MVNO started Data Saver, which allows customers to view video at DVD quality (480p) when hooked up to a cellular pipeline, allowing them to view three times as much streamed video while using the same amount of data. Starting on January 24th, Data Server was enabled by default for all new and existing Walmart Family Mobile subscribers. However, subscribers can disable the feature by going to myfamilymobile.com. Click on Profile, and then on Media Settings. Finally, next to Data Saver options, tap the switch to "Off." Those who end up signing up for the 10GB plan also are eligible to receive one free movie rental each month from Vudu. The latter is Walmart's on-demand streaming video service. If a customer with the 10GB data plan has an account in good standing after 16 consecutive days, he/she receives a $7 coupon code that must be used toward a free video within 30 days. 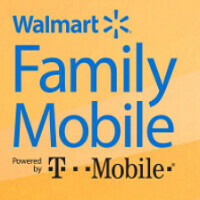 If you're interested in Walmart Family Mobile service, click on the sourcelink. Finally something beats the $55 Cricket plan. But does this come with Music Freedom? I know the $30 Walmart plan aka 5GB data/unlimited texts/100 minutes talk comes with Music Freedom.